MOTION Arjuna a specially designed coaching program which prepares NTSE Stage 1 & 2 qualified students for Engineering or Medical entrance exams like JEE (Main+ Advanced), JEE (Main), NEET, AIIMS etc with high ranks. We have started Arjuna program with one single purpose to ensure maximum learning environment for NTSE scholars so they develop the habit of learning and proceed towards the path of success throughout their academic career. These students will have to stay at Drona campus where our focus is on STRICT DAILY SCHEDULE and CONCEPTUAL UNDERSTANDING of all topics taught in class on daily basis. We believe our approach will boost confidence in these students and they will be more prone to success. Our mentors will be with them not only in class but even after it so all doubts will be cleared on the same day itself. 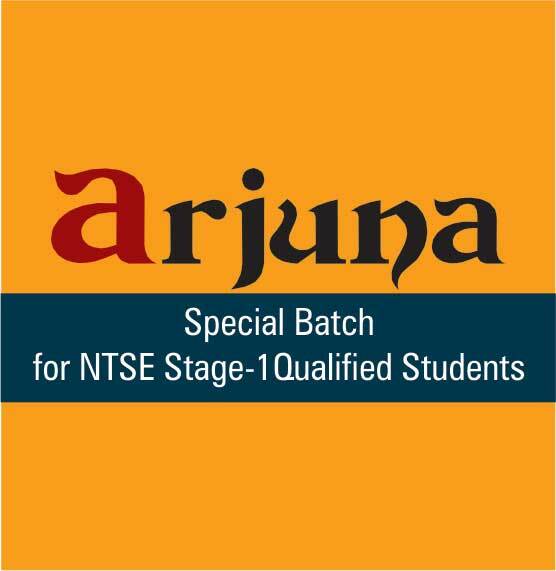 In today’s competitive environment ARJUNA will ensure a path to success for NTSE qualified students. The coaching FEE mentioned (i.e. 1 Rs.) is applicable for two sessions (Classes XI & XII), however if student does not clear NTSE Stage –II or under-performs in session one (Class XI), his fee for next session (Class XII) will be according to his performance in session one (Class XI). It is mandatory for students enrolled in Arjuna batch to stay at Drona campus. Charges for accommodation and food for Arjuna program will be paid upfront in single installment at the time of admission. If student Clears NTSE stage-II, Drona campus charges (accommodation & food charges) will be refunded, but only if he or she completes the two sessions (Classes XI and XII) coaching at Motion Education Pvt. Ltd. Kota Center. No refund will be applicable if a student leaves the course before completing it. Student will have to show original NTSE Stage-II admit card & deposit an self attested photocopy of the same as a proof of NTSE Stage-I qualification. To initiate the refund for food and accommodation the NTSE scholar will have to submit the copy of certificate received for the same.